Most self-defense training, whether martial arts or firearms, is focused on instilling physical skills. Unfortunately, critical elements are being left out. This is commonly because your instructors don’t fully understand the topics covered in this book– or worse are completely unfamiliar with this information. Information that will keep you out of the hospital or prison. If your instructor doesn’t know it, how is he going to teach it to you? For example: – Do you know when you claim self-defense you are confessing to what is normally a crime? – Did your instructor ever tell you that? – Or did he – as so many instructors do – tell you what he's teaching you is ‘self-defense?' – How much of your training time has been spent on when to use that training? – When not to? – What about how crime and violence really happen? (Not knowing that you may not get a chance to use your training.) – How do you explain to the police that what you did was self-defense and not you attacking your fellow citizen? – What will you need to be able to do to prove your innocence in court? 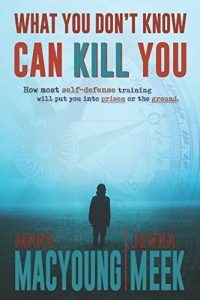 You'll learn these and many more important topics in this introductory book about what you haven't been taught about self-defense.